Max. Swing Over Bed: 660.40mm,Max. Machining Length: 993.14mm,Bar Capacity (Both Spindles): 63.50mm,Through Hole Diameter (Both Spindles): 76.20mm,Main Spindle Speed: 5,000 RPM,Main Spindle Motor (30 Min. 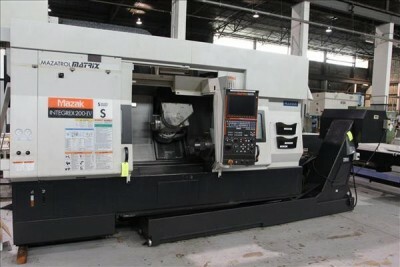 ): hassh22.37 kw,Sub Spindle Speed: 5,000 RPM,Sub Spindle Motor (30 Min. ): 18.64 kw,B-Axis Milling Spindle Travel Range: 225°,B-Axis Milling Spindle Speed: 12,000 RPM,B-Axis Milling Spindle Motor (20 ED Rating): 18.64 kw,C-Axis Indexing: .0001° Increments,Tooling Magazine Capacity: 40-ATC,Tool Shank: KM63,Tool Size, O.D. Turning: 25.40mm,Tool Sise, I.D. Turning: 38.10mm,X-Axis Travel: 579.12mm,Y-Axis Travel: 160.02mm (+/- 80.01mm ),Z-Axis Travel: 1043.94mm,X, Z-Axis Rapid Feedrate: 633.31 mm/sec,Y-Axis Rapid Feedrate: 433.07 mm/sec.Includes Operations and Maintenence Manuals, Mechanical Parts List, Electrical Drawings.